Remember, Anthony Watts is hardly in a position to judge the efficacy of homogenisation methods let alone point the finger at anyone else for fudgery. (His blog specialises in fudgery, among other things.) He has trouble figuring out what an anomaly from a baseline means. He can't quite get his head around how to work out that last year the global mean surface temperature was 0.7C above the average for 1951-1980 and, at the same time, was 0.3C above the 1981-2010 mean. The illogic of Anthony's allegation is lost on his audience, who are almost all conspiracy theorists these days. (You might have noticed that some of the people who used to pretend to be more rational in their denial are now coming out as big fans of the uber-conspiracy nutter, Tim Ball.) Conspiracy theorists have a remarkable ability to believe the impossible, and to hold multiple contradictory notions in their head at the same time. The fact that the NOAA record is similar to other records isn't proof that Anthony is wrong, in their mind. All it means is that every other organisation that maintains a record of global surface temperature is also fudging the data. In other words, the whole world is in on the hoax. It's only through the wonderful efforts of conspiracy theorising detectives that his fans know that the world is really cooling and we're well on the way to a deep ice age. Anthony has been promoting the notion that the world is heading for an ice age, any day now. See David "funny sunny" Archibald's prediction, and Fred Singer's, and only yesterday there was a very silly article by Ed "ice age cometh" Hoskins telling WUWT-ers that an ice age still cometh. The only way Anthony can get that notion accepted is by limiting his blog audience to cranks and the scientific illiterati. It's a far cry from last year's "extraordinary dinner"
Do you recall how last year Anthony Watts was completely blown away by his "extraordinary meeting" with real live scientists? It was a dinner party, after which Anthony had high hopes for what this small private dinner with lukewarmers and real live scientists would lead to. He had already mapped out the "next stage". It was to be a "shared scientific conference". I can see Anthony imagining the standing ovation he'd (not) receive from the world's leading scientists. Him, Anthony Watts, being celebrated instead of ridiculed and worse - ignored and unknown. Well, I think he's dropped back to reality now. The reality being that he's viewed (where he's known at all) as a rather nasty little blogger with a silly little blog that does nothing but promote conspiracy theories of the dumb if not always paranoid kind and tries to ridicule science and scientists. A dull and rather stupid man who measures his self worth by the number of wackos that read his blog. Anthony would have loved to be a major player in the disinformation game. However all he has these days is Tim Ball and his Hitler rants and childish fairy tales. Today's childish fairy tale is not in the class of Hans Christian Anderson, nor of the Grimm brothers. It's a very long way from Disney, too. It was something about parent's not accepting a school report on their child, and claiming he got all "A's" when he didn't. Not particularly funny or clever or applicable to his fraud allegation. There was much huffing and puffing and straw men galore in the various "thoughts" that Anthony's fraud allegation prompted. The comments are nothing more than a re-hash of the same wrong denier memes that have been floating around forever on anti-science blogs. I don't know how much of the commentary is from disinformers who are feeding their tripe to the denialati, and how much is from the illiterati themselves (the suckers). What it does show is that people who favour denier blogs have absolutely no interest in finding out facts. It's not as if the information isn't out there on the internet. It is - and has been for ages. Deniers aren't interested. 1) Maintain all of the raw data, and provide it upon request. 2) Specifically state the reason(s) for and amount(s) of adjustment(s) for every individual data piece adjusted. I’m looking for methodology here. 3) Provide the adjusted data upon request. Here are some pages from NOAA on the Global Historical Climate Network data, which I expect ScienceABC123 is talking about (but probably doesn't know it). For 1 the distribution of weather stations is not an even distribution. To give them all the same weighting is clearly wrong. Then there are problems such as weather stations that are moved, changes in the time of day the data is collected and changes to equipment. The homogenisation of the data is essential if you are to produce any meaningful data. Congratulations John, your application to Warmista Liars Academy has been accepted. Paul Jackson tells fibs and says he wants the raw data. If he wants it so badly, why doesn't he just get it? It's all there. Despite all the hours of free tutoring by WMO homogenisation expert, Victor Venema, evanmjones hasn't learnt a single thing. Gridding (what you describe) is important. Homogenization, however, is crap. OK John, I see where you are comning from. But how do you explain the ‘adjustments’ overwhelmingly being upwards? Sorry, sport but that is jus a bit too cute for me. I think I will just refer to the satellite/balloon data. It seems to be so… what is the right word? Robust? Reliable? Unadjusted? Maybe you are quite correct and it is just not possible to construct ( contrive?) a meaningful number from such a raggeday assed set of instrument data. So where does that leave us? B,lind faith with its eyes gouged out? So here’s my question. Every time that there is an adjustment, shouldn’t that increase the uncertainty of the actual measurement? Say that a max temperature of 90 +/- 0.5 degrees was measured, but after adjustments is now 89 degrees. The uncertainty has to be at least +/- 0.75 degrees now, doesn’t it? If you plotted the adjusted temperatures with adjusted error bars, would these adjustments really change anything? Marty also doesn't understand the process of homogenisation, or corrections to inaccurate data (see references below). Steve seems to think that the RSS satellite data is a measure of temperature at the surface. It's not. It is a measure of estimated temperatures at different levels in the atmosphere. I would think the adjustments they made to the NCDC data would be to bring the overall result closer to the most accurate system we have for measuring global temperatures, the RSS. They sold us on spending billions of dollars on the satellite based RSS because it would be so much more accurate than the measurements taken on land by the NCDC and others, now not only is RSS data less referenced than land collected (and adjusted) NCDC data, the NCDC data is continually adjusted to INCREASE the divergence between NCDC and the more accurate RSS data. NCDC data is a sales pitch, it is not scientific data, it’s primary purpose is to justify the budgets for the NCDC by exaggerating the amount of global warming going on and increase the sense of urgency for budgets that support climate monitoring and climate studies. If the purpose of the NCDC data was to be as accurate as possible they would be adjusting it to more closely match the RSS data. All microwave sounding instruments were developed for day to day operational use in weather forecasting and thus are typically not calibrated to the precision needed for climate studies. A climate quality data set can be extracted from their measurements only by careful intercalibration of the data from the MSU, AMSU and ATMS instruments. John Whitman couldn't resist posting his own silly "thought". He's a sucker who fell for Anthony's OAS fiasco, which looks to have been an abysmal failure. 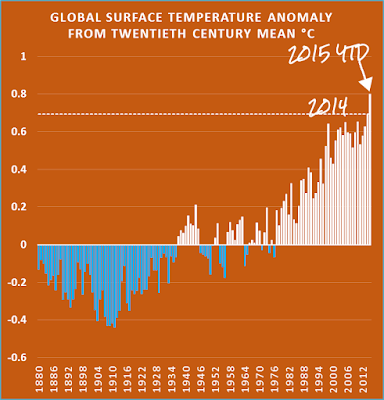 In defense of NOAA/NCDC, someone has to be in last place on climate science credibility. An argument could be made that NASA GISS is probably in last place on temperature dataset credibility with NOAA/NCDC only slightly more credible. As long as everyone here takes this as a joke nothing will happen. This is in fact criminal activity akin to Mafia criminal activity. This needs to be taken up by lawyers and the people doing this need to be charged. Various papers and articles on satellite temperature datasets - see the list of papers set out here. More interesting is how close he is skirting to a substantive embargo there. This is also known as preparing the ground I would think. The timing and content is far from accidental. Professional deniers only have 2 choices as the data come in. A tiny move towards the science (Rose) or an even larger move toward the lie (Watts). Don't be fooled if you think that Rose would move towards anything but the lie. Of course the same goes for Willard. Watts says he is maintaining the embargo on the release of the NCDC paper to be published in Science tomorrow ( 0700hrs Sydney time, 1600hrs PDT) but has already found a fatal flaw in the paper. Rose appears equally confident. I suspect the denier blogs, WSJ, The Australian, National Review et al will all be coordinating their attacks in an attempt to undermine the paper. The doyen of climate cranks, Fred Singer goes for a preemptive strike. "There will certainly be much debate also about my proposition of no evidence at all for AGW"
Sorry Fred. Apart from the usual nutters, no one cares what you think. Fred's one of the three a physicists they've got. I tried to read it on American Thinker but I have a thing about punctuation and grammar. I think l'll wait for Sou's analysis. On the face of it, she is being dealt an embarrassment of riches. Even for Watts, that's a moronic guest article. Watt's knows (or should) that strong El Ninos tend to kick out a lot of sequestered ocean heat leading to the next "escalator" step in atmospheric temperature rise. He's trying to keep control of the narrative. Propaganda 101. WAW "I don't know what you're doing, but I'm sure you're doing it wrong"
WAW "I don't know what I'm doing, but I'm sure I'm right"
Where can I find a good collection of past predictions of the Coming Ice? I wasn't taking down notes at the time, but seems to me this imminent ice age claim has been floated since the nineties. "Grandma hangs up the phone, beaming. She has just talked with her daughter-in-law, Gabrielle, who had said, “Final report cards are out, and Gavin has straight A’s!” So, Grandma hurries over to see this remarkable report card for herself. …"
The next 400words never move beyond such baby babble. Nothing said, juvenile ridicule, nothing more, and with such shields against learning they keep millions of faithful content in their ignorance. And the author E. L. Core supposedly has a B.S. in Mathematics and Computer Science and a series “Uncommon Core: Climate Sanity” that's "forthcoming later this year." Can hardly wait to see a hundred pages of such childish nonsense . . . while yet more time and energy is squandered as the seasons keep racing by - and the beat goes on. No desire whatsoever to learn anything, heck learning is the enemy of their God-given certainty. Watching all this unfold is terrifying. Over the next decades increasingly destructive weather events will be hammering our society, with ever more destructive fury, it's as sure the tides. But, thanks to such PR campaigns our global society and most of our business and political are content pretending it's not happening, or that it's someone else problem.